December 2010 – As a board member of Bible Open Air Mission, Justin Weberg went to India with Art Williams to help train national pastors. During this two-week trip, the Lord led him to consider expanding his efforts to start churches in NH. January 2011 – After phone calls from a few local men encouraging Justin to start a church in Plymouth, NH, the Lord began to impress upon Justin’s heart the need. February 2, 2011 – While reading 2 Corinthians 10:13-18, the Lord confirmed in Justin’s heart His leading to have him enlarge his ministry by starting a church in Plymouth as long as the people would let him stay in Colebrook. Justin called a few men that day to let them know of the Lord’s direction. April 7, 2011 – The first regular meeting of the church took place on this Thursday at the home of Wade and Veralisa Reed. “Following a devotional and time of prayer, we discussed and decided upon a church name, established and agreed upon a Statement of Faith, discussed a Leadership Team and the necessary officers to begin a ministry with integrity and accountability.” (Justin Weberg) Soon thereafter, the Plymouth Regional Senior Center became available on Sundays and Thursdays for services. April 14, 2011 – Having secured the legal documents for functioning, the church met for the first time on this Thursday at the Plymouth Senior Center to establish a Church Covenant, elect a Leadership Team, and to elect church officers. April 21, 2011 – The church met again and agreed upon a Mission Statement. A bank account had also been opened in the church’s name. April 28, 2011 – The church met to pray and plan for the first Sunday Service. May 1, 2011 – Grace Baptist Church met for its first Sunday Service. 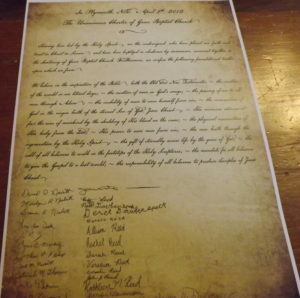 April 8, 2012 – Grace Baptist Church established and signed the church charter. May 12, 2012 – The Deacons and Offices were officially filled. November 7, 2013 – The Constitution for Grace Baptist Church was adopted. April 14, 2014 – The church voted to call Pastor Steve Anglea as their first full-time pastor.